It was a proud moment for Siemens Workers’ Union when the workers of Siemens – Verna – GOA factory approached SWU and expressed their desire to join SWU to form a union in Goa. In the month of June 2018 around 120 workers from three different units (CRP, DG PRO & MS) who were designated by the company at the time of recruitment as Executive Technician, became members of SWU so that they can work in the factory with dignity and to achieve good working conditions through Collective bargaining. There are few women workers who have also joined the union. The average age of these workers is 27 years.Hence the Committee of the Union decided to organize a Trade Union Education Workshop for them in GOA. On 5th August 2018, Trade Union Education Workshop was organised at Vaishnavi Hall, Ponda-Goa from 9.30 am to 5.00 pm. Around 75 workers attended the workshop. In the first session Gen.Secy Girish Ashtekar gave a brief introduction of SWU, its progress and achievements, its different projects and activities from its inception till today. He also mentioned about the various Wage and Bonus settlements signed by the union. He also mentioned how the Working of the Union has become more progressive and democratic since the involvement of youth in the decision making body of the union which started from Late Com. Uday Mahale who was the Gen.Secy of the Union for more than two and half decades.And since then the union has continued to involve youth in the decision making body of the union and the present Committee is the live example of it. Next session was the one which forced the participants to look at themselves and also the union with a different perspective. Mr. Rupesh Patkar a doctor by profession (Psychologist) guided the participants as to what is the need of union (unity) in our lives. He took this session in their local language which was quiet entertaining and at the same time very educating. After the tea break, Mr. Rajendra Giri, Dy director MKI explained the importance and relevance of Trade Union to the participants and also made them aware of the principles and characteristics of TU. At the same time he also explained what responsibilities the members have towards his union. The post lunch started with activities by Jt. Sec. Bhaskar Kotwal which helped the participants to stay alert after the lunch and also learn how their approach should be once they are a member of the union. Similar activity to emphasize on the importance of co-operation, co-ordination and participation was taken by Mr. Giri. Adv. Subhash George’s session about labour legislation started with the importance of standing orders and also brief introduction of Employment Standing order, PF, ESIC, Indl Dispute, Factories Act etc.with an interactive session in konkani language. The participants were not at all aware of these laws as they were designated as Executive Technician and none of these were applicable to them before forming the union. Gen. Secy. Girish Ashtekar explained the members about the demands to be presented to the management on behalf of workmen of above three factories in Verna.It has been resolved to raise the demand on behalf of these workmen. A movie that narrated the 50 years of journey of SWU made by Mahesh SawantPatel at the time of Golden Jubilee of the Union was shown to the participants. 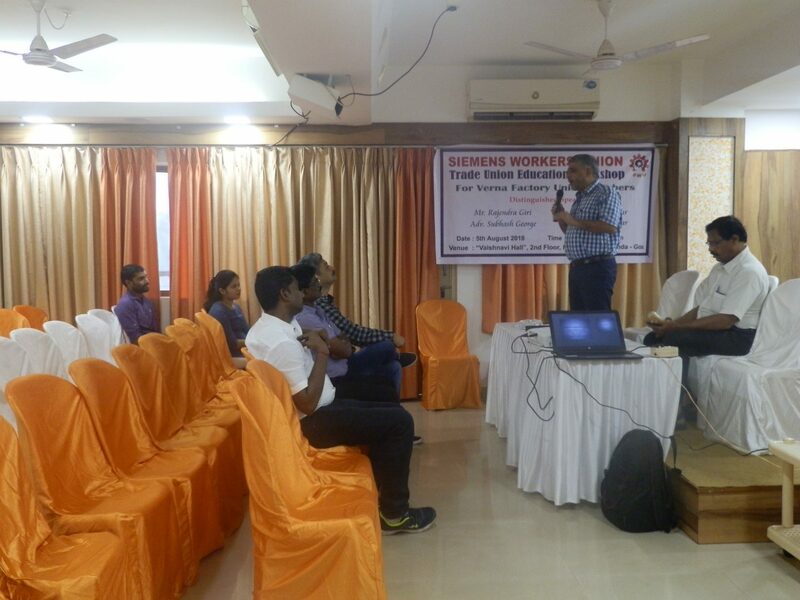 In the end President Mr. Mahesh SawantPatel thanked the workmen in goa for participating and also to those who have helped to organize and make this workshop a success.He assured them that similar workshop will continue to be organised for the workers of Goa and it is the need of the hour. Next Post:“Tree Plantation 2018” Support to Maharashtra State Govt initiative.